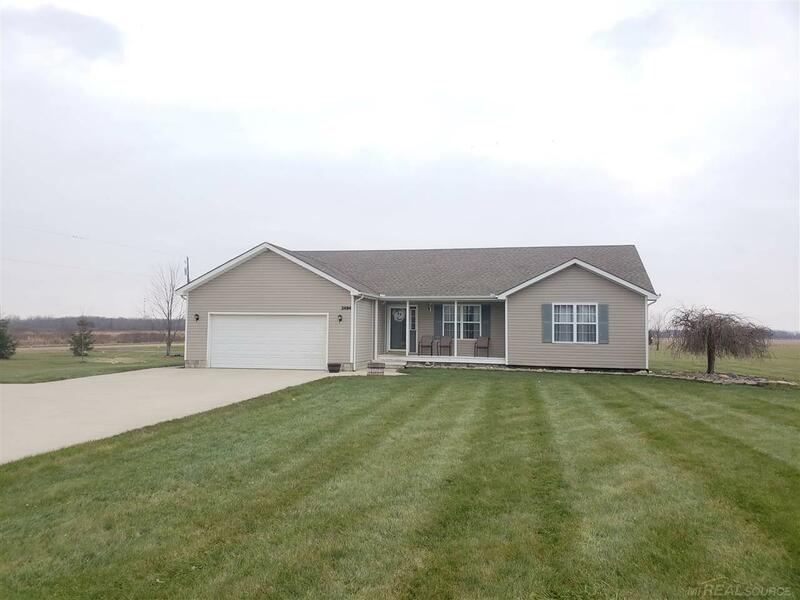 Don&apos;t miss out on this beautiful Ranch home in the country! This home is situated on a corner lot, paved road, and is nestled on 2 acres of property. This home features over 1700 sq ft, 3 bedrooms, 2 full bathrooms, an Open Concept Kitchen & Great Room that has recently been remodeled. New bamboo wood flooring, new carpet, and new Granite Countertops in the Kitchen! First floor laundry! Fully finished basement features a gigantic entertaining/living area, separate guest bedroom, and half bath. Exterior walls in basement have been insulated with spray foam. 24x32 Barn with cement, electric, separate driveway, and large overhang! Large front porch and stamped concrete patio off of kitchen. Full concrete driveway and turn around! Immaculate Condition!